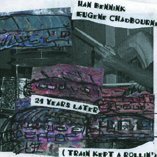 21 Years Later is an extended improvisation by Han Bennink and Eugene Chadbourne which also includes a selection of songs. Just like the Crescent Special the duo of Han Bennink and Eugene Chadbourne rolls on through the musical night, stopping every now and then to take on some passengers. This is a recording of a very special night in Atlanta, Georgia. Han puts Eugene in a mellow mood, and when Dr. Chadbourne starts singing you don't know whether you want to smile or cry.